The Cumberland & Dumfriesshire Farmers Mart P.L.C. had forward 7,088 store lambs on Tuesday 19th October, 2010. Buyers were out in force with trade sharper. Top price of £67.50 for Texels from Sunnycroft and Cocklakes House, others to £65.50 Toftholm and Carretrig, £65 Greensburn; Suffolk £67 East Unthank, £64 High Crindledyke, £63.80 Allenhead; Greyface £67 East Unthank, £60.80 Greyside, £60.50 Blindhillbush; North Country Cheviot £66 Haithwaite; Beltex £58.50 Winterhope; Lleyn £55 Chipknowe; Herdwick £47 Ramshope; Swaledale £45.50 East Unthank, £43.50 Whitton, £40 Byers Hall. Cast ewes to £68 from Linton House with hill types to £50 Linton House. Breeding ewes to £78 for Texels from Linton House; Greyface to £64 Carretrig; Blackface £49 Linton House. The Annual Show of Hill Cheviots attracted an entry of 1,936. Trade again extreme for best Cheviots. 1st prize – D. McGarva, Granton, Moffat and sold at £61.50. 2nd prize – Messrs White, Hartsgarth, Newcastleton and sold at £59. 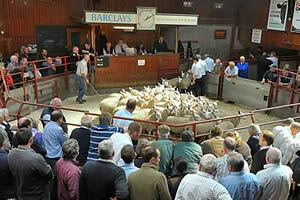 3rd prize – Messrs Elliot, Burnfoot of Ewes and sold at £53. Other prices were as follows - £63.50 East Murton, £61.50 Routin Lynn Farm, £60 Girnwood, £58 Sorbietrees. The Annual Show of Blackface lambs attracted an entry of 2,125. Trade was again dearer on the week. 1st prize – Jamie Halbert, Chapel House, Gilsland and sold at £55.50. 2nd prize – Messrs Walton, Wanwood Hill and sold at £58. 3rd prize – Messrs Robson, Yatesfield, Otterburn and sold at £60.50. Other prices were as follows - £57 Horseholme, £56 Yatesfield, £54 Townshield, £53 Greyside, £52 Allensgreen.